2015년 11월 8일 삼성서울병원 본관 대강당에서 열린 대한소화기기능성질환운동학회 연수강좌에 다녀왔습니다. 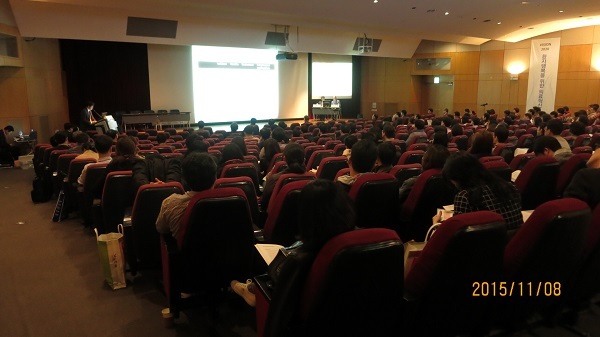 Nonceliac gluten and wheat sensitivity: is it matter in Asia? 라는 제목의 경상대학교 김현진 교수의 강의를 바탕으로 정리하였습니다. 글루텐이란 곡류(주로 밀, 보리, 호밀 등)에 포함된 불용성 단백질입니다. 글루텐의 양이 증가할수록 곡물반죽에 탄력이 있고 음식이 쫄깃해집니다. 글루텐 함량이 많으면 강력분, 중간이 중력분, 적으면 박력분이라 합니다. 글루텐은 50-70% 에탄올에 녹는 gliadin과 녹지 않는 glutenin으로 나뉩니다. 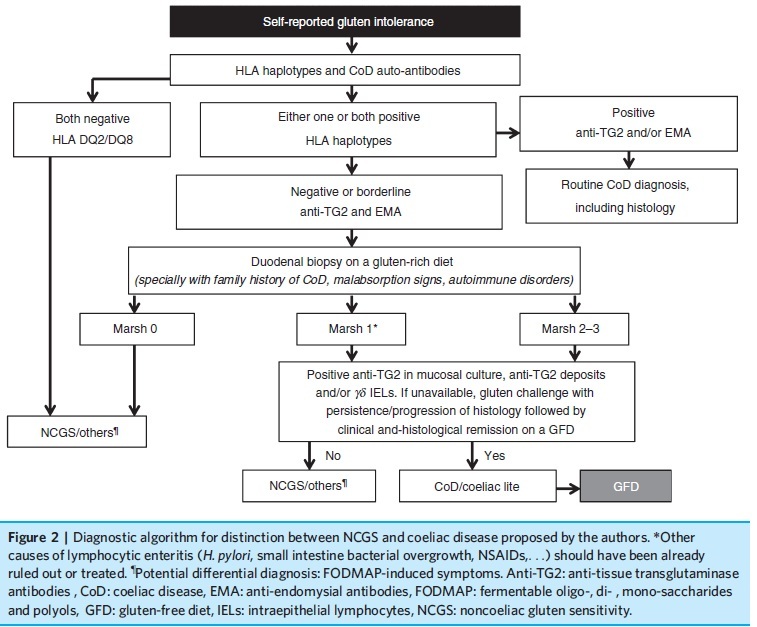 Celiac 병은 유전적으로 감수성 있는 환자(예, HLA DQ2/8)에서 글루텐에 의해 유발된 비정상적인 점막 면역작용의 의해 소장의 만성 염증과 흡수장애가 발생하는 질환입니다. 우리나라에 celiac 병이 존재하는지 아직 명확하지 않습니다. 1개의 증례보고가 있으나 (Gweon TG. 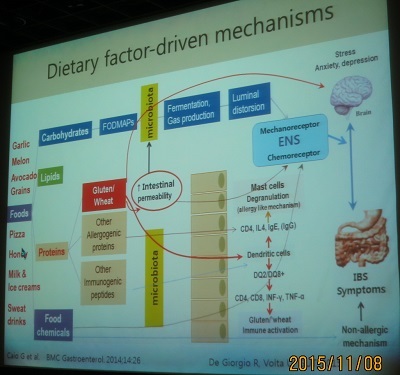 Korean J Gastroenterol 2013), celiac 병에서 흔히 관찰되는 자가항체인 IgA endomysial antibody와 IgA tissue transglutaminase antibody가 모두 음성이었기 때문에 정말 celiac 병이 맞는지 논란이 있습니다. 항체를 포함한 보다 전형적인 임상상을 가진 celiac 병 증례는 아직 보고되지 않고 있습니다. An 36-years-old woman complained non-specific abdominal pain and diarrhea. She had anemia and was taking medication for osteoporosis. Colonoscopy showed no abnormality except shallow ulcer at the terminal ileum. Gastroduodenoscopy showed micronodularity at the duodenum 2nd and 3rd portion. Capsule endoscopy and enteroscopy showed villous atrophy and blunting of villi from the duodenum. Small intestinal pathology showed villous atrophy with lymphocyte infiltration. 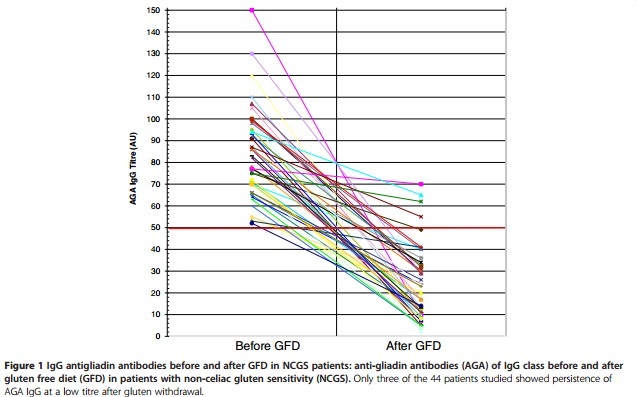 After gluten free diet, diarrhea, abdominal pain, anemia and osteoporosis were improved. And, she felt well-being sensation. 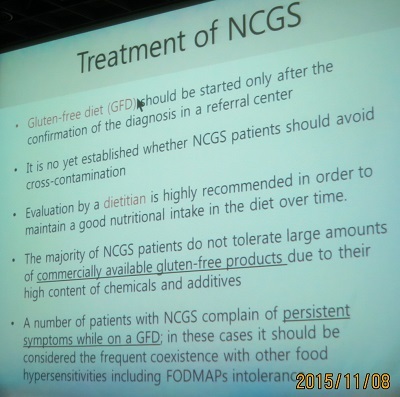 글루텐 연관질환 (gluten-related disorders)은 다양한데 기전에 따라 세 종류로 나눌 수 있습니다. (1) 자가면역(autoimmune)과 관련된 것이 celiac disease, dermatitis herpetiformis, gluten ataxia입니다. 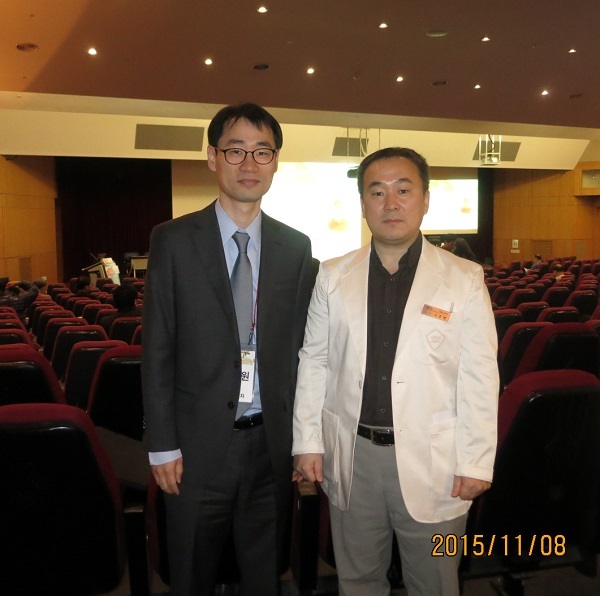 (2) 알러지와 관련된 것으로 respiratory wheat allergy, food wheat allergy, wheat-dependent, exercise-induced anaphylaxis (WDEIA) 등이 있습니다. 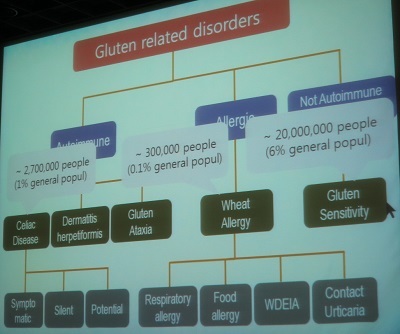 (3) 자가면역도 아니고 알러지도 아닌 (not autoimmune, not allergic = innate) 종류가 gluten sensitivity입니다. 이 중 셀리악병과 매우 유사한 증상이 글루텐 식이에 의해서 발생하지만 유전적 원인을 찾을 수 없는 비셀리악 글루텐/밀가루 민감성에 대한 관심이 늘어가고 있습니다. Non-celiac gluten sensitivity를 진단하기 위해서는 gluten에 의하여 증상이 유발되는지, gluten을 끊으면 증상이 호전되는지를 명확히 확인해야 합니다. 밀가루를 먹으면 배가 아프다고 하는데 밀가루를 끊어도 증상이 지속되는 환자가 흔한데 이들은 celiac 병 혹은 non-celiac gluten sensitivity로 보기 어렵습니다. Gluten-free product로 시중에 나와있는 제품의 장기 복용은 주의해야 합니다. 글루텐 없이 비슷한 맛을 내기 위하여 수십종의 식품첨가물이 사용된 제품이 많아서 안전성을 담보할 수 없기 때문입니다. 5. 송경호 선생님께서 Stretta에 대한 메타분석을 소개하여 자료를 찾아보았습니다. 2014년 2월까지 발표된 4개의 무작위 전향적 연구(165명)의 메타분석이 발표되었습니다 (Lipka S. CGH 2015). 제목부터 negative result였음을 강력히 보여주고 있습니다. No evidence for efficacy of radiofrequency ablation for treatment of GERD. 메타분석에서 언급된 미국 FDA 자료에 의하면 4명이 사망하였습니다. We collected data from 4 trials and a total of 165 patients (153 patients were analyzed). Three trials compared Stretta vs sham, and 1 trial compared Stretta with PPI therapy. The overall quality of evidence was very low. The pooled results showed no difference between Stretta and sham or management with PPI in patients with GERD for the outcomes of mean (%) time the pH was less than 4 over a 24-hour time course, LESP, ability to stop PPIs, or HRQOL. 메타분석의 discussion을 일부 옮깁니다. 18개 연구 1,441명 pooled data를 보여준 Perry의 연구를 가차없이 비판하고 있습니다. The beneficial effects of Stretta reported by Perry et al were based on single-arm, pre-post design studies, which are prone to regression to the mean, making the efficacy of Stretta susceptible to a high risk of bias. Regression to the mean is a statistical phenomenon that affects all pre-experimental designs that include, or analyze data from, participants selected on the basis of an extreme, usually low or high, pre-intervention condition. 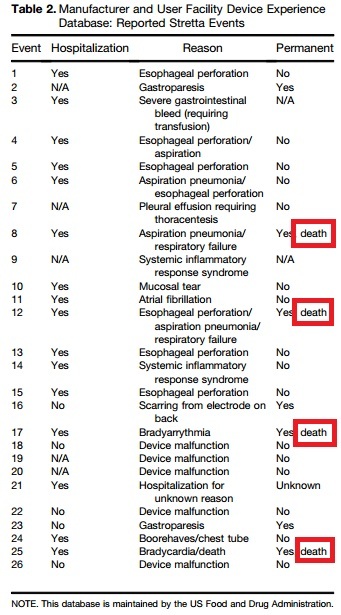 Although there is well-recognized value to using single-group studies to identify and quantify the occurrence of adverse events, the role of these studies in evaluating efficacy and safety is not well developed.29 Therefore, the nearly unanimous efficacy of Stretta for the management of GERD observed in single-arm studies is not appropriate for informed decision making. Recently, SAGES made a "strong recommendation" about the use of Stretta for GERD. However, the panel members of SAGES did not provide details on the process of how they arrived at this recommendation. Although Stretta’s mechanism of action for the treatment of GERD is not understood fully, it appears to increase the resting tone and reduce the incidence of transient relaxations of the LES. Although data from human beings are lacking, this appears to result from induction of hypertrophy and fibrosis of the LES, and possible tissue neurolysis. Until more good-quality evidence is available, we agree with the new American College of Gastroenterology guidelines (2013) on GERD that the "current endoscopic therapy... cannot be recommended as an alternative to medical or traditional surgical therapy." 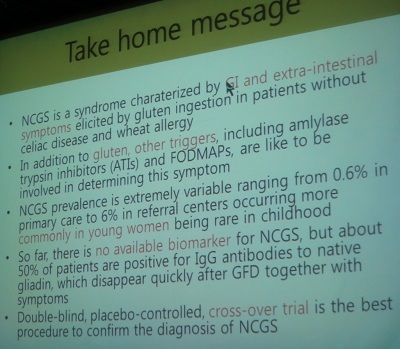 [2016-8-5] 삼성서울병원에서는 celiac disease와 같은 gluten-related disorder의 진단에 유용한 검사 코드를 신설하였습니다.